You know what I haven’t had in FOREVER? Mexican food! I think it’s been like two weeks. That is a long time for me. Last week I was a snacker. You know what a snacker is? Someone who prefers to eat a bunch of tiny things than eating a full meal. I think I did that most of last week. Well after last weeks sweets, treats and snacks, I told you and myself that this week I was going to get healthier. I told myself, no snacking, eat three full meals a day, a mid morning snack and my after dinner frozen yogurt. I have done good! I have done that since Friday and I feel so much better about myself. One thing about snacking is you tend to over eat. So silly! But this week, I am back to my old self and wanting Mexican so I whipped together a 10 minute total time for dinner. And let me tell you it is sooooooooooo good! 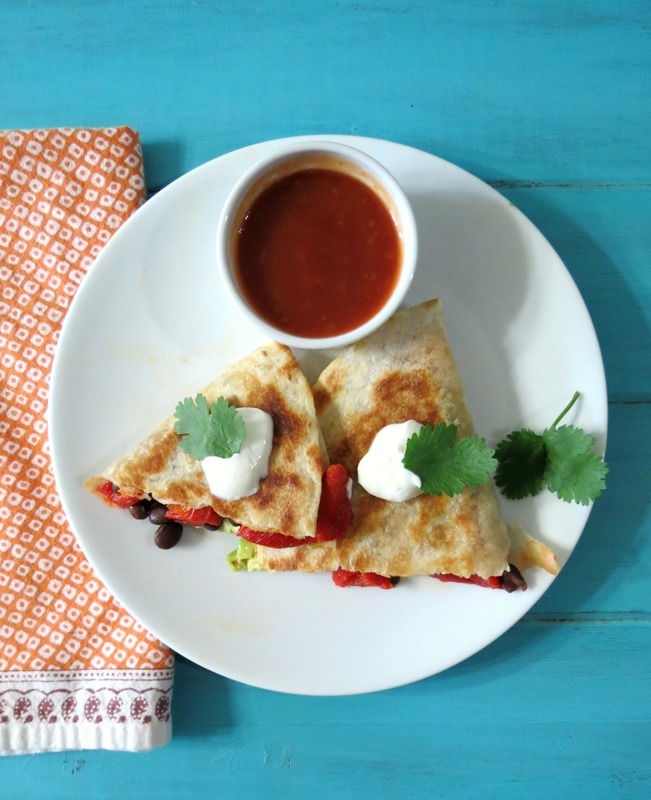 I made cheesy, beany, roasted red pepper quesadillas! I haven’t had a quesadilla in about a year! I happened to wander into my local Mexican grocery store yesterday and all I could smell was something wonderful throughout the store. My mission was to find where the smell was coming from! I let my nose do the leading and there it was. Thy were making fresh flour tortillas in the bakery. Oh my gosh!!! I had to have them!! So I bought a 12 pack and they were still warm in the packaging. I had to control myself from eating one right then and there! When I cam home from the gym, there was no hello, it was I need to make a quesadilla now!!! I whipped together this wonderful quesadilla in a matter of minutes. A piece of advice, when you go to a Mexican grocery store buy the flour tortillas. They aren’t great on nutrition, but only contain a 100 calories and so worth it!! So worth it! Homemade beats the stuff in the store by a long shot. They are light, flaky and taste authentic! Trust me on this one! One thing I know is bread and tortillas!!! Oh and if you never been to a Mexican grocery store, go to one! It’s so much fun!! 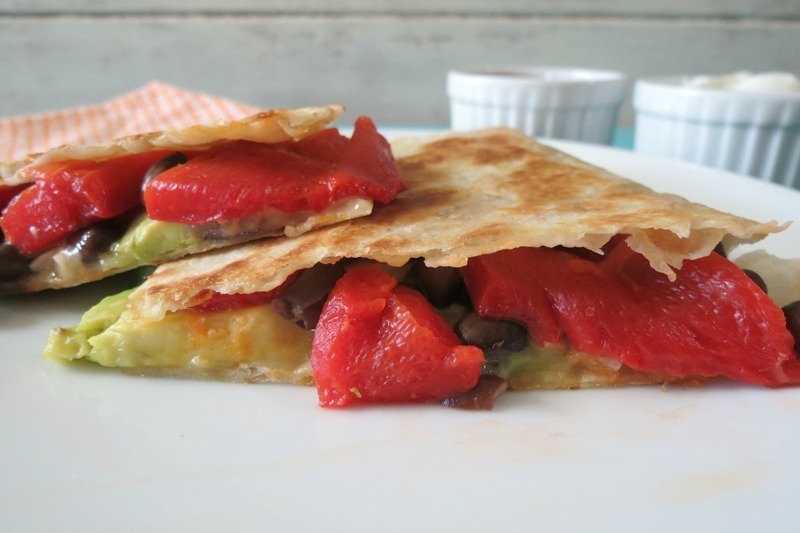 The quesadilla is made with black beans, roasted red pepper from a jar, avocado and Monterey Jack Cheese. I made one with the addition of salsa, but it made it a tad to watery, so I skipped it on the second one. I sprayed a 10″ frying pan with cooking spray, added my tortilla and added my topping while it was in the pan. Makes it easier doing it this way than transporting the filled tortilla to the pan. The quesadilla was perfect! It was thick, cheesy, creamy and had a nice crunchy shell. I forgot how much I love quesadillas. I don’t have them to much because of calories, but this one only came out to 265 calories, which is pretty darn good! I had the quesadilla with a side salad. Perfect for a weeknight meal! 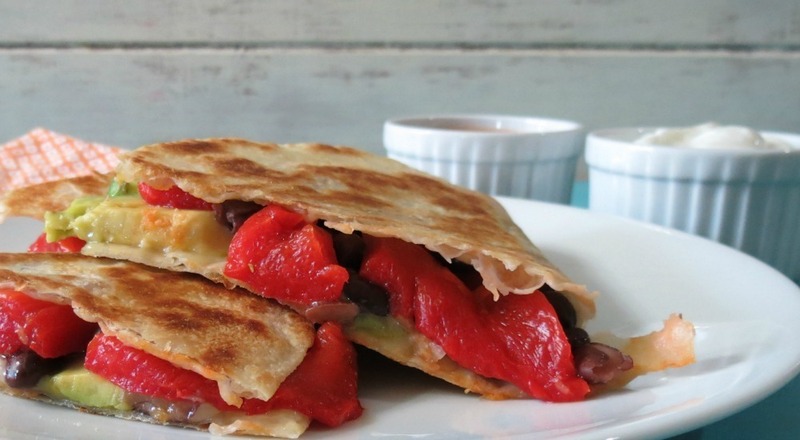 A Mexican cuisine made with a flour tortilla that is filled with roasted red pepper, black beans, avocado and topped with monterey jack cheese. Perfect for a quick week night meal or appetizer. Spray a non-stick skillet with cooking spray. Place flour tortilla in skillet. 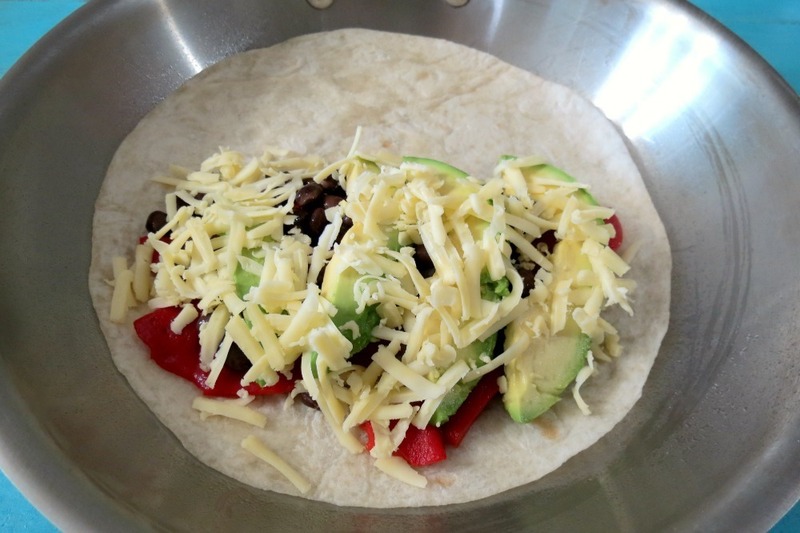 Add black beans, avocado, roasted red pepper and cheese over one half of the tortilla. Fold other side of tortilla over to make a half circle shape. Spray the tortilla lightly with cooking spray. Place skillet over medium low heat. Cook the quesadilla on one side until lightly golden. Carefully flip tortilla and cook until lightly golden and cheese is melted. Place cooked tortilla on a cutting board and with a pizza cutter, cut into wedges. 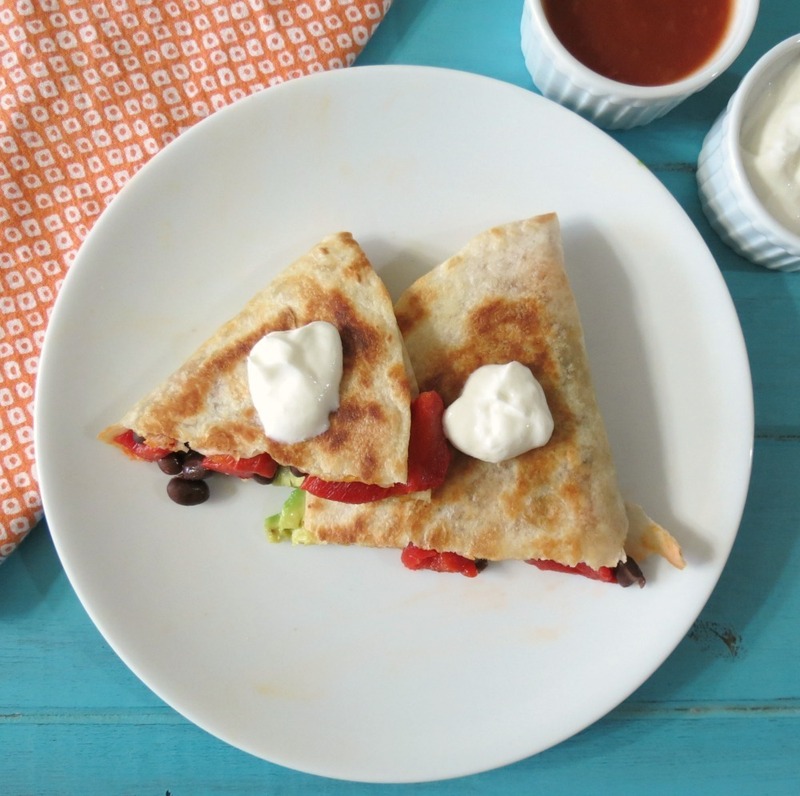 Serve with salsa and greek yogurt or sour cream. Nutritional calculation using a 100 calorie tortilla shell and full fat cheese. I just love quick and easy meals like this, especially when you come home from work and the last thing you feel like doing is making dinner! I have to say it again, if you go to a Mexican grocery store, pick up the tortillas. You will not regret it!!! Just be sure you don’t go much over 100 calories. So worth it!! Well my Friends, How I Met Your Mother will be on in a few minutes, so I am off to chill out for the rest of the evening!! Such a great, quick dinner! I could eat Mexican food every night of the week! I’m with you! I just love Mexican!!!!!!!!! Love this! 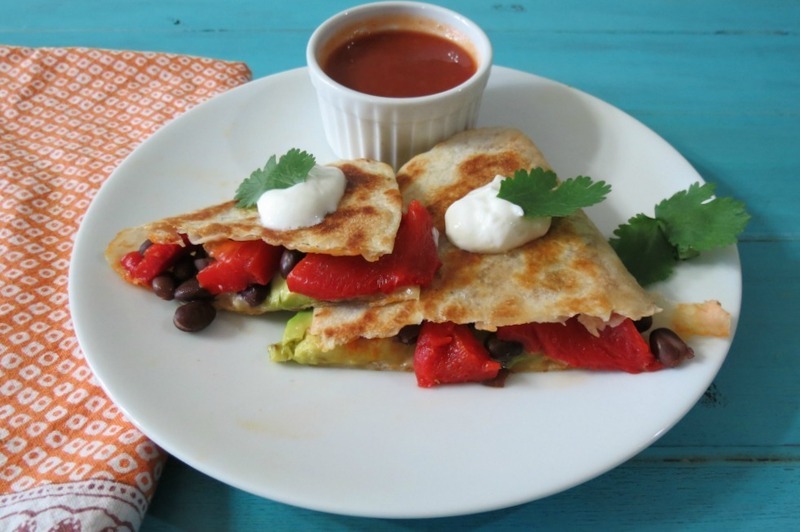 So fresh and flavorful – quesadillas do make the perfect weeknight meal! I know! I just love them! I don’t make them nearly enough!! Jennifer, you are right on about fresh tortillas. We have a regular grocery, which caters largely to Mexicans (80% of our population is Latino), and they have a tortilleria. Their tortillas are the best I’ve ever bought, and everybody is willing to stand in line to get those tortillas. I’m surprised that the store sells any of the commercial tortillas. I personally prefer my homemade whole wheat/mesquite flour tortillas, but when I don’t have time to make them, I know where to go to get good ones. I’m glad you have a place locally that makes good ones. This looks so good! Wish I had one now! You know how much I would love these, huge YUM!! !